The multilingual Muslims in undivided India during British rule had Urdu as their lingua franca, while Hindi was the lingua franca of the Hindus. These two languages are quite similar in terms of sound and structure. However, there are two clear differences: firstly, Urdu is written in Arabic script although Urdu has more letters than Arabic, while Hindi is written in Devanagri script. The second difference is in vocabulary, with Urdu having many Arabic and Persian words while Hindi is full of Sanskrit words. However, there are quite a few Sanskrit words in Urdu and a significant number of Arabic and Persian words in Hindi. In fact these two languages are not original languages, but lingua francas. In other words, they are combinations of various languages. Bangla also has many Sanskrit words, but due to pronunciation differences it is not always easy to understand Hindi. Urdu is the mother tongue of many people in the Indian states of Uttar Pradesh, Madhya Pradesh and Delhi. The capital of Urdu is there. The Nizam (ruler) of the Southern Indian state of Hyderabad had declared Urdu as the state language and paved the way for the language to develop by making it the medium of instruction at Osmania University. Most of the Islamic literature published in India since colonisation have been in Urdu, which contributed to a huge collection of Urdu literature. With many books in English translated into Urdu, the language is now considered very rich. Pakistan was created with four provinces in the west and one province in the east. The people in these provinces spoke different languages. The main languages of the four western provinces are Punjabi, Sindhi, Pashtu, and Baluchi, although the common language of the educated people in all those provinces is Urdu. Although these four languages have developed significantly since then, they hadn’t developed much literature at that time. Urdu was the medium of education in madrasahs and the scholars practised the language widely. As Urdu was compulsory in schools, modern educated people were able to learn the language. Considering all this, it can be said that Urdu was the most common language of West Pakistan at that time. However, apart from those who studied in madrasahs, modern educated and common people in East Pakistan knew nothing about Urdu. Making Urdu the only national language would certainly make people in this region, even those who completed university, completely illiterate in different affairs of the state. I found it difficult to understand why those who were in favour of Urdu as the only state language did not realise this matter. They were probably in the wrong illusion that a nation state should have only one state language. That probably led them to declare that Urdu would be the only state language of Pakistan. However, one has to condemn the effort to persist on this despite Tamaddun Majlish starting a movement demanding the declaration of Bangla as one of the state languages of Pakistan. The huge personality of Mohammad Ali Jinnah was able to temporarily tame the movement for the state language, but the publicity campaign for the demand continued. The Dhaka University Students’ Union organised a huge student rally at the University Gymnasium Ground on 27 November 1948, where students from all educational institutions were invited to attend. The occasion was very important; it was to submit a Memorandum to the then Prime Minister of Pakistan, Nawabzada Liaqat Ali Khan, on behalf of students. As my classes for the MA ended in June 1948, I didn’t go back to stay in the hostel after the summer holidays, instead staying at my uncle Shafiqul Islam’s house in Tikatuli, Dhaka. I had to continue the duties as General Secretary of the Students’ Union although as there was no election for the 1948-49 session. However, due to not staying at the hall, an Acting General Secretary was nominated from the elected representatives. The responsibility for writing the memorandum to be read to the Prime Minister was given to the then Vice President of Salimullah Muslim Hall, Abdur Rahman Chowdhury, (who later became a renowned justice of the Supreme Court) with a committee approving the draft. The problem arose as to who would read it out at the event in front of the Prime Minister. The natural choice would be the Vice President of the Students’ Union, but as the VP was a Hindu, it was decided that considering the demand for Bangla as a state language was the most important aspect of the memorandum, it wouldn’t be wise to ask Arvind Bose to read the memorandum. The main reason for this decision was that the Muslim League government had already started to confuse the public saying that the demand for Bangla was mainly the demand of the Hindus. Hence, it was decided that Ghulam Azam would read the memorandum as the General Secretary of the Students’ Union. As students from all educational institutions attended the event, the huge ground was packed with people, including on the adjacent roads as well. The Prime Minister, Nawabzada Liaqat Ali Khan, was seated on the right of the Chair of the programme with his wife Begum Rana Liaqat Ali Khan sat next to him. When I stood to read the memorandum, I noticed that Mrs Khan was just a couple of yards behind the microphone stand. The introduction of the memorandum was to warmly welcome the Prime Minister and to reiterate our commitment to the development of peace and prosperity of Pakistan, to underscore the need to bring unity between East and West Pakistan, and to condemn the narrow mentality of those who only work for regional and provincial interests. The Prime minister became very happy with this introduction and clapped while I kept on reading the memorandum, written in eloquent English, in a loud and clear voice. When I read the section demanding Bangla be declared a state language, the whole audience gave a huge round of applause supporting the demand. I paused to allow for the clapping to continue. I started reading again. This time I repeated the paragraph about the language issue even more firmly. Again the clapping started and some stood up clapping. After the audience became calm, I read out the remainder of the long memorandum and handed it over to the Prime minister on behalf of the students. He shook my hand and accepted it without saying a word. I became even more worried and wondered how the audience would react if, taking the suggestion of his wife, he used the same language as Jinnah and clearly spoke against the language demand. What would I do if he did that? Would it be possible for me to sit quietly on the stage when the whole audience wanted Bangla to be a state language? I decided that I would instantly protest saying, “No, No” if he said anything against our demand. As I was getting increasingly tense what the Prime Minister would say, I found him change his tone completely. He talked positively about our other demands; asked students to concentrate on their studies; and asked them to grow up as worthy citizens of the nation. However, he said absolutely nothing about the language issue. He could have said that he was not able to make a decision about this without talking to the Parliament. He probably decided not to say anything against it considering the sentiments among the audience. Despite not being happy with his speech, I had no opportunity to protest as the clever politician managed the situation very deftly. The first Prime Minister of Pakistan was assassinated at a public meeting in Rawalpindi on 16 October 1951, and the then Governor, General Khwaja Nazimuddin, became the Prime Minister. Although he was from the Nawab Bari of Dhaka, his mother tongue was Urdu. On 27 January 1951, Khwaja Nazimuddin declared at a public meeting at the Paltan Ground that Urdu will be the only state language of Pakistan. He wouldn’t have made this declaration if he had been as clever as Liaqat Ali Khan. I was astonished at this, as he was the person who had signed a treaty to consider Bangla as a state language when he was the Prime Minister of East Pakistan. The language movement attained a new momentum after Khwaja Nazimuddin’s announcement. On 21st February, students defied Section 1441 and demonstrated in favour of their demand. The procession started from Dhaka University campus. When it reached the front of Dhaka Medical College Hostel, police fired upon it killing four people and injuring another 17. This killing triggered a mass movement in East Pakistan demanding Bangla to be declared a state language, culminating in the movement’s success the following year. I was working at Rangpur Carmichael College at that time. Like other parts of East Pakistan, students brought out processions in Rangpur as well. I and my colleague Professor Jamiruddin were among those who led that demonstration. As a result, both of us and some leading students were arrested on 6 March. 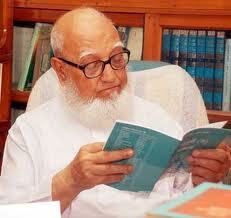 The jailor of Rangpur was a friend of Professor Jamiruddin. I and Jamiruddin were flat mates at that time when he came to visit his friend. I had been curious about life in a prison since boyhood, when I used to live in a tutored lodging adjacent to the walls of Dhaka Central Jail in 1939. Prior to my arrest, I asked the jailor if he could take me around the jail, and he said he could do so after getting permission from the authorities. Incidentally, a month later, the same jailor put me and his friend into jail and didn’t have to bother asking permission to show me around. The Jailor felt very embarrassed, particularly because he couldn’t arrange division2 for us in jail on the first day and we had to sleep on the floor like common criminals resident there. He fast tracked the process the following day and arranged our division swiftly. This was my first experience of jail, and I actually liked it. A prison cell is very effective if one wants to come closer to Allah. When one is away from the family and confined within high walls, then Allah becomes their only resort to get comfort, and He becomes ever closer. No prison wall can stop this. He is the only person to talk to. The taste of pure submission I felt during Tahajjud during those days was unprecedented. However, I was very sad for one reason. That was the spring time of my married life, as I was newly married just three months earlier on 28 December 1951. We had just began our life together as a family in mid-January, when I brought my wife to my college accommodation. I had to stay in jail for 25 days and it could have been longer if my uncle, Advocate Shafiqul Islam (former leader of Muslim League), had not arranged my release through the then provincial Prime Minister, Nurul Amin. During British rule, five colleges in undivided Bengal were known as premier colleges. Four of the colleges, apart from the Presidency College in Kolkata, are in Bangladesh, with Carmichael College being one of them. Situated two miles away from Rangpur city, the college is on a huge stretch of land encompassing nine acres. I used to love the college campus for its beautiful serene environment. I got a bit worried looking at the timetable as I was given 24 lectures over six days a week for first and second year BA students. Professor Gopal explained that I was the only lecturer in my subject and needed to take all the lectures on Political Science and Civics. I was also told that Professor Abdul Mannan of the Economics department used to take these lectures before. I went to the principal and requested him to relieve me from such a high teaching load. He called Professor Gopal and they both requested Professor Mannan to take six of my 24 lectures, which he kindly agreed. I eventually got 18 hours of teaching a week. I reminded them that only good students have the courage to ask questions as their inquisitive minds would like to understand things clearly. I also told them that I would like to help them learn and whoever has this attitude would find me beside them. Their expressions told me that the students were encouraged by my words and looked happy when they left class at the end of the lecture. In the corridor outside the classroom, around eight to ten students surrounded me and said, “We have never heard such beautiful advice.” I saw quite a few students behind them nodding in agreement. I felt content after my first lecture. I took up teaching not only as my profession, but also as a passion. My mission was to help my students develop as good human beings. I always believe that this should be the only reason for taking up teaching as a profession. Those who do this only as a job will fail to make this contribution as they spend every day as monotonous routine work and are not lucky enough to have the pleasure of developing good human individuals. My salary was only 180 taka, which was much less than one could get in a government job. As a result meritorious students who possessed the qualities of good academics joined the civil service to earn better livelihood. However, my motivation to become a teacher was entirely missionary, so my pay scale was never a priority for me. I used to encourage my students to take up this profession saying that this is the only profession which expects one to maintain good moral character. This profession enables people to keep themselves away from bribery and corruption and encourages them to build future citizens who have good moral character. I was a teacher at Rangpur Carmichael College for only a few years. I would have spent my whole life in this profession had I not felt compelled to leave it for the sake of the Islamic movement. I loved the profession so much that I would often dream that I was giving lectures at my college or walking towards college. Another advantage of teaching as a profession is the respect one gets throughout one’s life. During my organisational visits to greater Rangpur and Bogra districts, I would often find my former students, many of whom were teachers themselves. Is it possible to measure the love and respect they showed towards me? This is much more precious for me than any material goods in this life. My father used to say that no one wants to see others more successful than themselves other than parents and teachers. Genuine good teachers get respect from their students as parents get from their children. That is why for me it is the best profession and one that builds humanity. The Prophet (PBUH) said, “I have been sent as a teacher.” However, he didn’t say that to mean a profession, but as the teacher of mankind, because he is the ideal teacher for every aspect of our lives. There was a break of 45 minutes for Zuhr (noon) prayer and most teachers who used to pray would go back to their campus accommodation to pray. Students would pray at the Lalbagh Bazar Mosque nearby. Some of them could be seen praying on the grass inside the campus. I felt that there should be prayer arrangement in the college building, which would make it easier for everyone to pray and encourage more people to perform their prayers. With this in mind I convinced the principal to allocate a room for prayer in the main college building. Among the lecturers, I was the one always present during the prayer and I would spend 20 minutes each day to discuss about different aspects of Islam. I would pray there every day even when I didn’t have a lecture. I observed that due to my discussions on Islam the attendees in the prayer room started to increase. I would use a blackboard to explain things on Islam, and despite having teachers of Arabic and Persian attending prayers, who were also Islamic scholars, students considered me their teacher on Islam and would often come to me with questions.